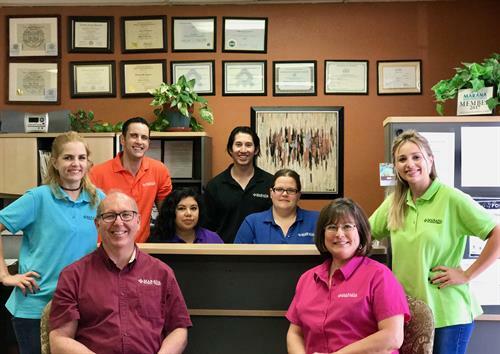 Practicing the art of physical therapy for 30+ yrs., Connie and Jerry McCollow created in Marana Physical Therapy, a friendly environment that is tailored to the individual and strives for quality, modern, evidence-based treatment. The goals are to reduce pain, improve function and return each patient to their full potential. Treatment may include any or all of the following: heat and cold modalities, certified advanced manual therapy techniques such as gentle joint mobilization, soft tissue work, or manipulation; and exercises including home instruction. Education is a priority at Marana Physical Therapy. Patients will learn how to manage their diagnosis and prevent injury through education in ergonomics and self treatment techniques, along with individualized exercise programs. Our setting includes both an open gym and private treatment rooms. Please visit our website at maranapt.com or give us a call at (520) 297-5837! Use the Sunset Rd exit to get to Orange Grove Rd or Cortaro Farms Rd exits from I-10, then take Thornydale Rd to Ina for our Ina Rd office. Our second office is accessible via the Twin Peaks exit.